Jonathan, who is affectionately known as “Boss-Man” by his crew, has worked for Silviculture Contractors Ltd for many years. SCL is a well-known forestry contracting crew throughout the upper North Island and are employed by many forest companies including PF Olsen in the Northland and Central Regions. The contract crew is very well respected and a large part of this is the ability for the owners (Craig & John Zielinski) to be able to rely on a few key people. Jonathan is one of those people. He is well respected by the crew but remains focussed on doing a good job for the client. An excellent Leading Hand he is committed to being trained for the task, and carrying out jobs to a very high standard. He has a lot to do with rural fire fighting in the North and is well respected in this skill. Jonathan started with the Zielinkis’ around nine years ago in their pruning gang and worked extremely hard on “piece-rate” to get enough experience and skill to improve his productivity. Craig Zielinski told me that he always remembers Jonathan saying during this period that he would “rather work” for his money. A great work ethic! Jonathan’s style is to lead by example, and he now has three of his sons working in the crew. A major strength is being able to work well with a wide range of people, from managers to fellow workers and he has certainly earned the title of Boss-Man in the best sense of the phrase. 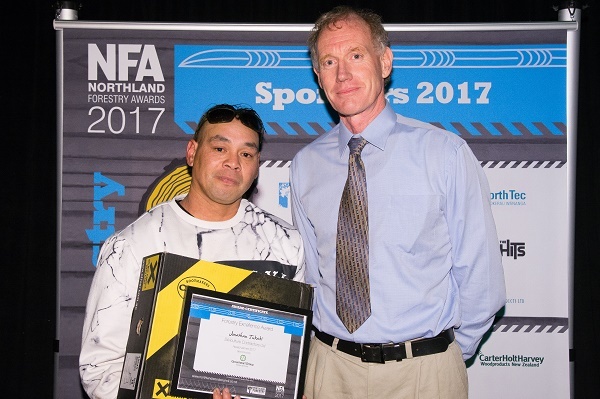 Jonathan being presented with the Forestry Excellence Award.